Unique eclectically styled 100-year-old miner’s cottage a mere 20 mins walking distance to the ever-popular bustling Leura Mall and a short 7 minutes drive to Katoomba and all its attractions. Piccolo is ideally located in the heart of the Blue Mountains, so close to all that this World Heritage listed area has to offer. A wide selection of outstanding restaurants and cafes, stunning National Parks with awe-inspiring walking trails, boutique shopping, gourmet and fresh food markets, artisan markets, Leura Golf Course, picturesque gardens, and a constant evolving exciting calendar of local events. Luxurious queen sized bed with an assortment of European sized pillows and plush duck down pillows. Piccolo is designed for couples although a sofa bed is available if needed. All bed linen and towels are provided. Fully equipped kitchen with farmhouse ceramic sink, high quality modern stainless steel oven and gas cook top perfect for a simple or gourmet romantic dinner for 2 or for the family. A wide selection of entertaining books and magazines to read from the library wall, DVD’s, games and puzzles in the dining room. Complimentary WIFI with Netflix and Spotify. Fantastic gated covered veranda with grandpa and grandma rocking chairs and outdoor setting overlooking the garden perfect for a sun-drenched outdoor lazy morning breakfast or sunset happy hour listening to the Kookaburras. On a cold Winter’s day relax in front of the open fireplace with your favourite beverage with a good book, DVD, Netflix, or cook up hearty comfort food in the farmhouse kitchen. You can even soak up the morning sun rays on the veranda with a warm cuppa. We have designed Piccolo with comfort and relaxation in mind. As you soak up the surroundings of native birds chirping in the trees we want you to feel that you that when you arrive it will become your home away from home too. Unwind and enjoy everything Piccolo has to offer and we hope you are drawn back someday soon. Dog and Cat Friendly too! We warmly welcome your furry companions. We just ask if you would kindly keep them off the furniture and clean up after them. If bookings are cancelled within 1 month prior to the stay a 100% cancellation fee applies. We spend 10 years living in Bondi and work in Sydney because The Blue Mountains were just a bit far to commute from every day. 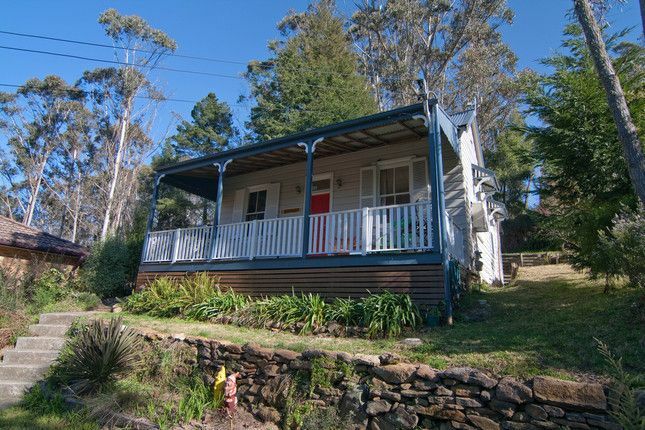 But we finally made to move to permanently live in the Blue Mountains. Since I grew up in countryside England I need the escape from the city. We saw Piccolo in 2010 and both Holly and I knew we needed to buy it to rest and relax from the pressure of city live. I'm sure there are many of you that feel the same and we hope you enjoy our little mountain getaway. This was the second miner cottage we looked at the first sold and day we enquired. I have always worked in travel and knew a property like this would work well in the mountains. It was bought for love (I know you should never buy property for love) but we thought why not. And we couldn't afford to buy where we wanted to live in Sydney. Final 6 years late after visiting the mountains mouthly we took another jump and moved to Katoomba. It's was built in about 1905 and retains all its character with squeaky floorboards but we have added all the mod cons and given it character with mid-century furniture. Thanks to the great decor and design, this little place felt like home. Retro touches made us nostalgic for our Nans but the house was also cosy and well-equipped. This is a lovely place to stay. Nice location and very peaceful except for the possums fighting on the roof. Enjoyed a short summer break in the Blue Mountains. Despite the very hot weather Piccolo stayed cool. Insect screens would make for a more peaceful night's sleep, but comfortable nevertheless. We (the dog and I) did lots of bush walks, wandered into Leura to enjoy the shops and cafes. Walked to Katoomba and even found an early opening cafe New Years Day! Felt completely rested and refreshed on return to the bustle of city life. The kitchen & dining room (new - lounge room) have flyscreens on the sash windows. The bedroom window is an outward opening window so difficult to add a flyscreen.